Inversion of relief is a common attribute of landscape evolution and can occur wherever materials in valley bottoms are, or become, more resistant to erosion than the adjacent valley slopes. 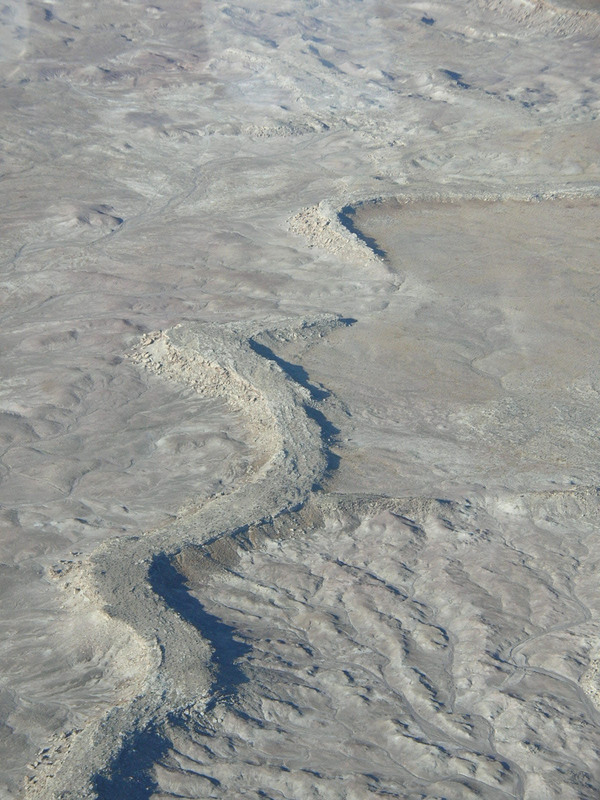 Image 1: An oblique aerial photograph of a carbonate-cemented, sinuous inverted paleochannel segment located approximately 11 kilometers southwest of Green River, Utah. Multiple processes can lead to the development of relief inversion including cementation of the valley floor (e.g. ferricrete, silicrete, calcrete, gypcrete), armoring of the valley floor by coarse grains and infilling by a more resistant material, commonly a lava flow. Differential erosion removes the less resistant valley slopes and preserves the valley floor as a topographic high. Various terms have been ascribed to channels preserved in inverted relief including ‘raised’ channel systems, ‘suspendritic drainage lines,’ ‘gravel-capped ridges,’ ‘perched wadis,’ or ‘wadi ridges,’ and ‘suspenparallel drainage’. Inverted channels have been identified in a number of locations around the world including the Arabian Penninsula, North Africa, Australia and North America. Subsequent drainage patterns develop depending on the nature of the channel floor resistant agent. For example, water parallels the margin of lava-filled paleochannels resulting in twin lateral streams. In contrast, more complex drainage patterns can develop in locations where duricrusts formed as dissolution can yield discontinuous preservation of the paleochannel as duricrust-capped mesas. The exhumed ridge in Image 1 extends approximately 1 km in linear distance, and stands approximately 35 m above the subjacent plateau. Modern drainage is particularly well developed in the lower right portion of the image and has created a water gap at image center. The arid climate promotes sparse vegetation and inhibits soil development, two factors that enable the landform to be readily discernible in aerial images. Based on burial reconstruction models for the region, the cemented channel sediments were first re-exposed at the surface a maximum of 650,000 years ago. Illumination is from the left. 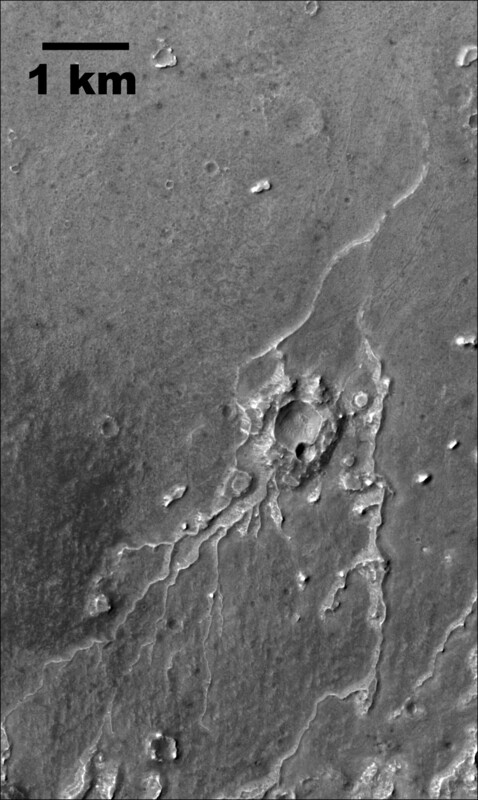 Image 2: Viking MDIM image at left provides regional context for this unnamed valley network in Arabia Terra. 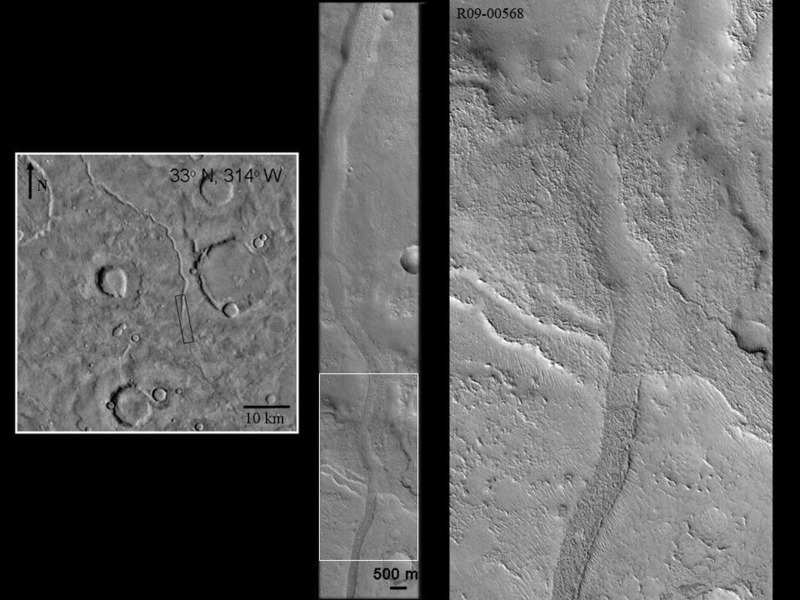 At right is MOC image (R09-00568) that shows the negative relief channel transitions to a low-relief positive relief plateau. The continuity relationship between the traditional valley network and the ridge form is evidence that the entire system was once formed by flowing water. The southern portion experienced erosion that removed the valley walls and resulted in the former channel floor preserved as a local topographic high. Illumination is from the left. On Mars, ridge landforms with similar attributes to terrestrial inverted paleochannels have been identified at a number of locations (Images 2 and 3). Various terms have been ascribed to these landforms, including ‘sinuous ridges’ and ‘raised curvilinear features’. The induration agent for the inferred martian inverted channels is unknown, however discontinuous preservation of some of the ridge forms is suggestive of cementation. In contrast to terrestrial inverted paleochannels which are commonly exhumed by fluvial processes, wind is likely the dominant erosive agent on Mars. Preliminary age assessments for these martian landforms indicate that they may have a longer surface exposure age than their terrestrial counterparts. Image 3: Subscene of CTX image P01_001377_1887_XN_08N076W_061111 of branching ridge network located on Lunae Planum. The dendritic pattern, low junction angles, as well as the number and spacing of low order tributaries are all evidence of a fluvial origin to the landform.